While South Carolina experienced at truly devastating flood, I was dealing with my own, little, invisible one. My 110 year old house has hardwood floors throughout that are, for the most part, in very good shape.... except for the kitchen floor. Because there was damage, and because I have dogs, I put down vinyl planks. This was a 3 step process, first 3/4 inch plywood, then 1/4 inch Masonite, and then the planks. I also own a side by side Whirlpool refrigerator, that's about 9 years old and still works like a charm. For some reason only the designers know, Whirlpool put the water filter down at floor level. In order to change it you need to get down on your hands and knees. Two months ago this filter needed to be changed, so I got a new one out of the cupboard and set it on the kitchen counter, got down on my hands and knees, pushed the release on the old filter, and removed it. However, during this process Big Seig, my then 6 month old, and very large, Boxer pup got the the new filter from the counter thinking it was a brand new, fancy dancy chew toy. When I got it from him the label looked a bit chewed up, but other wise the filter looked fine, and so I installed it. 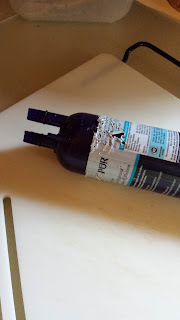 Unbeknownst to me, however, he had managed to damage a teeny, weeny, black rubber gasket, and as a result, once the filter was installed, it began a steady drip... and drip... and drip. There is a small drip pan under the filter which filled up to the brim, and then for every drop that went into the pan, a drop went over the side. And, of course, one of the seams for the vinyl planks runs directly under the drip pan. So, for some time water has been soaking in to the Masonite, which began to swell. Four days ago I looked at the floor around my refrigerator and said to myself, "that looks odd." So, getting down on my hands a knees, investigated and discovered the problem. The damaged filter has been removed and a new one ordered. The dripping has stopped. Now I'm just waiting to see how much damaged has been done. This is how it goes some times.